Like most parents, Jessica and Josh Swainston were excited to discover they were having a baby. But when they went to their first prenatal appointment, the Swainstons were given some heartbreaking news about their soon-to-be third child. Doctors didn’t think that the baby would survive through the pregnancy; they told the couple to prepare for a miscarriage. Miraculously, when the couple went in for a 12 week checkup, doctors discovered that their little boy had actually grown, despite all odds. But then, at 21 weeks, the Swainstons found out what had caused concern at their very first ultrasound. 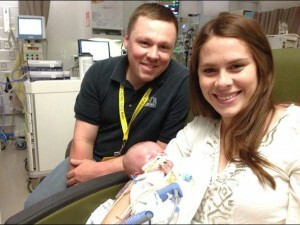 Their baby had a congenital diaphragmatic hernia (CDH). Affecting about 1 in 2,500 pregnancies, the condition causes a malformation of the diaphragm. In turn, the abdominal organs start to push themselves up into the lungs. Though doctors have learned how to better treat the condition, and morbidity rates have dropped, it is still considered a serious cause for concern when diagnosed. 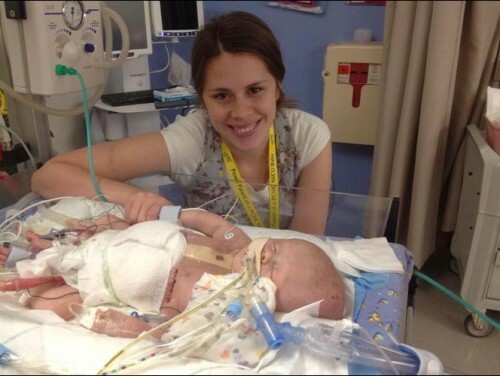 Sadly, upon his delivery on July 10th at the University of Utah Hospital, the couple learned that the little boy they named Max was worse off than doctors had predicted. Given less than a 50 percent chance of survival, one of Max’s lungs was the size of a nickel, and the other one – his good one – had a leak in it. Heart weak, the tiny newborn also had an infection somewhere in his body. All of this was in addition to his hernia. In short, doctors expected the worst. But, just like when his mother was pregnant with him, Max has continued to defy the odds at almost every turn. Now dubbed “Miracle Max” by his family, the little boy continues to improve. He’s been taken off some of his medications, and doctors are now monitoring his lung function to see how things go. While he may not be out of the woods yet, it seems there might very well be a chance that he’ll pull through. But the family says, for now, they’re just taking it one day at a time. Prepared for the long and difficult journey ahead of them, they say they’re taking the time to enjoy the small miracles as they come. Local representative for a national group called Cherubs, a CDH awareness organization, Josh Hensley and his wife have lost two daughters to CDH. He says it’s more common than people realize, and his organization’s goal is to educate while offering support to families affected by the condition.